Some of us may be acquainted with studies that suggest direct intake of sunlight affects dopamine and serotonin expression1,2,3. I’d like to put an idea on the coffee table that may further explain some of the physiological effects of Sungazing. Not all of the information taken in by the optic-retinal formation has pathways to the visual area in the back part of the brain. Some of the retinal information has projections to the brainstem area, where blinking and some saccadic eye movements are mediated. Retinal projections also reach the superchiasmatic nucleus(SCN), a collection of neurons that make up part of the hypothalamic structure. 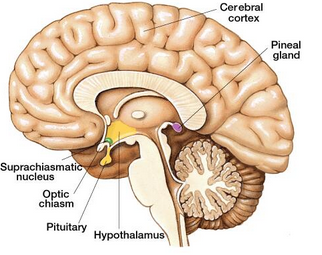 The hypothalamus is located at the ventral base of the brain directly above the pituitary gland. 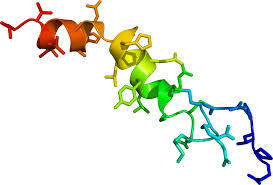 This structure is quite small, only 4 grams, taking up about 0.5% of the volume of the entire brain. It is often divided into ten areas, associated with functions including: hunger, thirst, thermogenisis, sexual activity, goal-seeking behavior, endocrine functions, and influencing activity in the parasympathetic nervous system. The parasympathetic system promotes calm restful states. Some of the retinal neural signals arriving at the (SCN) of the hypothalamus make downstream projections that eventually find their way to the Pineal gland, which is associated with sleep/wake/circadian cycles and maturations during puberty. Many people would like to believe that the pineal is integral to higher consciousness, the seat of the soul, the third eye, or other properties that are mystical in nature; and that may be all good and well. 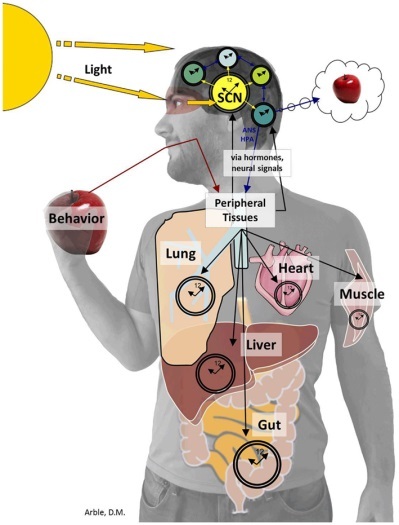 What is important to keep in mind is: sunlight entering the eye, is transcribed into neural information that projects directly to the superchiasmatic nucleus (SCN) of the hypothalamus, because within the hypothalamus many things take place, including neural activity known to produce Orexin and Oxytocin. 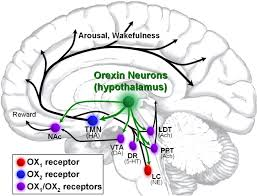 “The overwhelming majority of orexin production occurs in the hypothalamus, yet orexin signaling is not limited to the CNS”. Orexin A and B are neuropeptides associated with systems that regulate emotion, reward, and homeostasis for maintaining proper vigilance states. 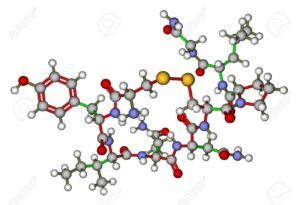 Patients with narcolepsy and animals with a defective orexin system cannot maintain a consolidated wakefulness state. Patients with narcolepsy, orexin defects, are also prone to gain weight. It is well established that the hypothalamus is integral in feeding satiation and modulating sleep/wake cycles. And although there is no direct evidence, it seems reasonable to entertain the idea that absorption of direct sunlight decreases the need for food intake and sleep, as hundreds of sungazing practitioners have reported. The impact of sunlight on hypothalamic activity may someday, in part, offer explanations for these reported effects. 1.Tsai HY, Chen KC, Yang YK, Chen PS, Yeh TL, Chiu NT, Lee IH. (2011). Sunshine-exposure variation of human striatal dopamine D(2)/D(3) receptor availability in healthy volunteers. Prog Neuropsychopharmacol Biol Psychiatry. 2011 Jan 15;35(1):107-10. doi: 10.1016/j.pnpbp.2010.09.014. Epub 2010 Sep 26. 5. 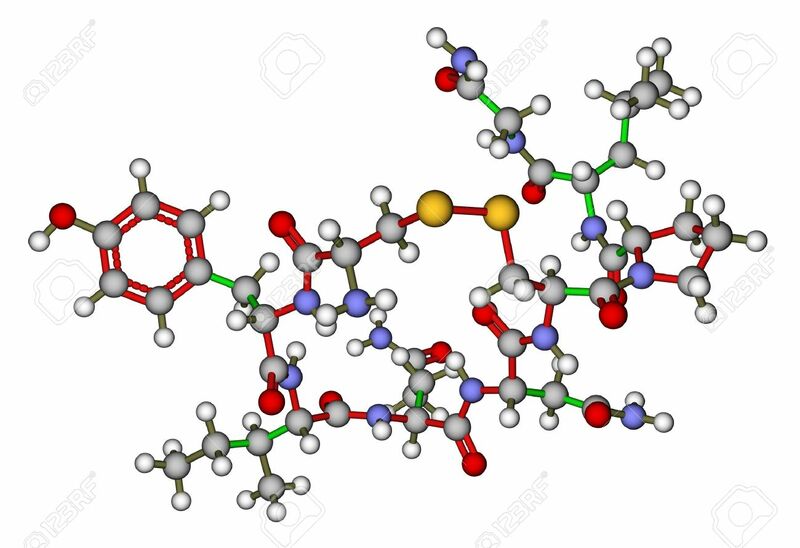 Zak PJ, Stanton AA, Ahmadi S. (2007) Oxytocin increases generosity in humans. generosity. Ann NY Acad Sci 1167:182–189. endogenous oxytocin release after physical contact. Evol Hum Behav 29:375–383. 8.Taylor SE. (2006) Tend and befriend: Biobehavioral bases of affiliation under stress. 9. Pankseep (2012); The Archeology of the Mind: Neuroevolutionary origins of human emotions. W.W Norton and Company, 500 Fifth Avenue New York NY 10110.